The nation is failing as a direct consequence of these four catastrophic policies. 1. President Johnson's expansion of the Vietnam War, which set the stage for President Nixon's continuation of that disastrous war for an additional five years. For those who missed the 30-minute lecture on the Vietnam War in history class, Johnson took a low-intensity guerrilla war in South Vietnam in which the U.S. was supporting a corrupt and venal South Vietnamese elite and expanded it into a full-blown war with over 500,000 troops on the ground and numerous other forces engaged in a vast regional conflict. Johnson's basic motivation was domestic politics: being a domestic political animal, Johnson was obsessed by the possibility that the Republicans could accuse the Democrats of being "soft on Communism" and win congressional seats in the next election if he declared victory and withdrew from Vietnam. To insure this wouldn't happen, Johnson relentlessly pursued a war in ways that guaranteed it couldn't be won while killing and maiming millions of people, mostly civilians, and squandering the lives of U.S. servicemen and women. Johnson did not follow the Constitutional requirement of declaring war with congressional approval. He opted to undermine the Constitution with an open-ended declaration of Imperial Presidential Powers (The Gulf of Tonkin Resolution) to wage unlimited war based on a "fake news" fictitious attack on U.S. ships in the Gulf of Tonkin. But the war itself was only one disaster of many. To mask the complete and utter failure of his "limited" war, Johnson launched a massive, concerted "fake news" propaganda effort in support of the "we're winning the war" narrative. When Daniel Ellsberg released the Pentagon Papers, the true story was revealed: thousands of Deep State insiders knew the war was unwinnable and was being lost, at great cost. But few dared challenge the disastrous policy or the lies and propaganda being distributed by the federal government in support of the war. Meanwhile, the "law enforcement" efforts of the FBI were focused on draft evaders and other dissenters. Organized crime got a free pass as the FBI was politicized to fight domestic dissent--an institutionalized politicization that continues to this day. Both the FBI and CIA engaged in concerted, covert and completely illegal campaigns to infiltrate, disrupt and destroy dissenters in the anti-war and civil rights movements. This was well-documented by the congressional Church investigations in the early 1970s. Simply put, Johnson's policy of pursuing an illegal full-scale war laid waste to the Constitution and launched an era of official "fake news" propaganda and the politicization of federal law enforcement. These disasters live on to this day, as official "fake news" propaganda and the politicization of federal law enforcement is the New Normal. No wonder the Vietnam War remains a poorly understood taboo topic; understanding the destructive consequences of the war's embedded policies is extremely dangerous to the status quo. 2. President Clinton's deregulation of banking/finance in the early 1990s. Eliminating the common-sense and easily enforceable Glass-Steagall Act separating investment and commercial banking (and other limitations as well) opened the floodgates of financialization, i.e. institutionalized fraud and embezzlement which reached full flower in the 2008 Global Financial Meltdown triggered by U.S. banks and other financial institutions. 3. President G.W. Bush's Invasion of Iraq and the launch of Endless War (tm).President Bush followed Johnson's playbook to a Tee: a "fake news" fictitious excuse for launching a full-blown war (weapons of mass destruction lurking in hidden bunkers, etc. ), a wildly unrealistic understanding of the culture and politics on the ground (civilians would greet our conquering troops with flowers and smiles, etc.) and a propaganda machine spewing official fake news about our wonderful spreading of democracy via war. The complete and utter failure of the invasion policy ushered in the current era of Endless War(tm). $3 trillion squandered and countless lives lost, and all for what geopolitical gains? 4. Presidents G.W. 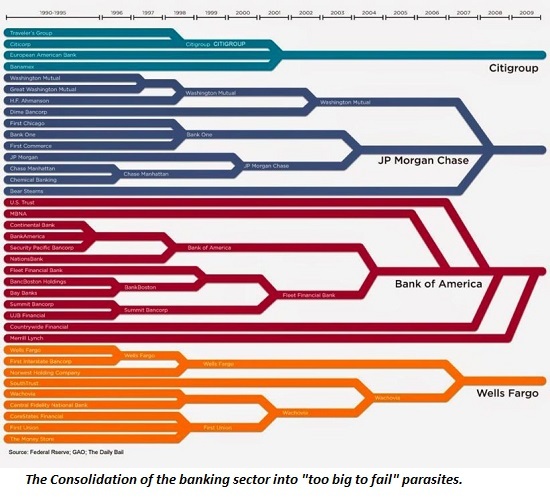 Bush and Obama's rescue of predatory parasitic banks in 2008-09. The nation had a once-in-a-century opportunity to eradicate the predatory parasite (the financial sector) that's killing the economy and democracy of the host (the USA) and replace the "too big to fail" aristocracy with 1,000 local and regional financial institutions with severely limited powers to institutionalize fraud and embezzlement and leverage fictitious collateral into unprecedented wealth and political power. Instead, both Bush and Obama obediently knelt down and served up $16 trillion in taxpayer-funded bailouts, backstops and loan guarantees to rescue the "too big to fail" aristocracy from their well-earned collapse. The crippling inequality and dysfunction plaguing our economy can be traced back to this abject and needless surrender of sovereignty to the financial sector. The nation is failing as a direct consequence of these four catastrophic policies, policies that undermined our economy and system of governance, that introduced the poisons of official fake news and propaganda, that institutionalized the suppression of dissent and institutionalized the fraud and embezzlement of "too big to fail" financialization. Thank you, Gary T. ($5/month), for your splendidly generous subscription to this site -- I am greatly honored by your support and readership. Thank you, Ljerka M. ($4), for your most generous contribution to this site -- I am greatly honored by your support and readership.